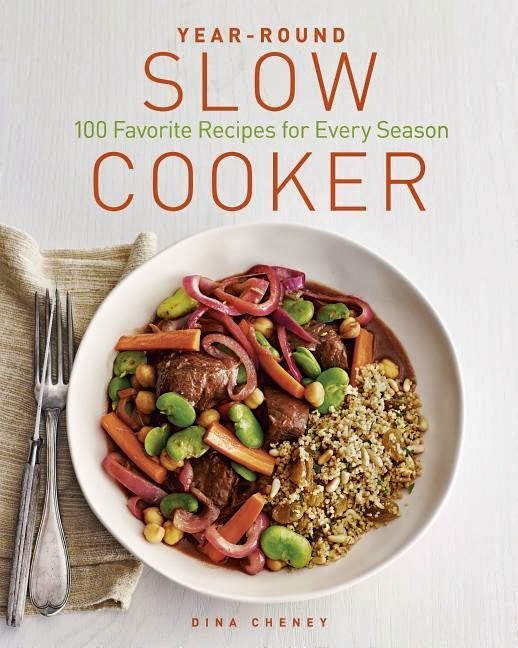 Year-Round Slow Cooker: 100 Favorite Recipes for Every Season, by Dina Cheney (Taunton Press): Dina Cheney has worked to combat the common myths of the slow cooker: that they are for winter meals, and/or that they only turn out goopy, mushy, watery dishes. While both of those things can be true--who doesn't love a goopy stew in the winter, after all?--she argues that there is so much more the slow cooker, and the 100 recipes here back her up. Level of effort ranges from easy (chop, put in slow cooker, return to meal in 8-10 hours) to more complicated (with stovetop browning, mixed ingredients, temperature changes during cooking). Even the more complicated dishes, though, are straightforward and easy to follow, and the extra steps are absolutely worth the extra flavor. I've made three meals from this book so far, and with the recipes broken out by season (based on both seasonal appropriateness, because no one wants to eat beef stew in July, and seasonal ingredients), I don't plan to stop any time soon. 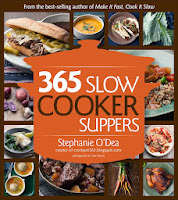 365 Slow Cooker Suppers, by Stephanie O'Dea (Houghton Mifflin Harcourt): Stephanie O'Dea runs the popular blog A Year of Slow Cooking, and this book is a collection of her latest and greatest. Where Cheney's recipes aim to re-invent the slow cooker, O'Dea stays more within the realm of the "fix-it-and-forget-it" recipes. This is not necessarily a bad thing, however, as some of these recipes result in a stunning amount of flavor with a shockingly little amount of work. Take, for example, 2-Packet Chicken, which calls for frozen chicken pieces, 1 packet of taco seasoning, 1 packet of ranch dressing seasoning, and 1 can of tomatoes, cooked on low for 8 hours. It doesn't get much simpler than that, and while most of the recipes in 365 Slow Cooker Suppers are not quite that simple, this recipe gets at the heart of O'Dea's mission (as a person who owns no less than 15 slow cookers herself): simple, easy-to-prepare dinners that can fit into the lives and households of very, very busy people. The verdict: 365 Slow Cooker Suppers is a traditional, well-planned collection of recipes for the worker-bee in all of us. They call for very little potching (I broke out the food processor and did the "chopping" for five recipes in one afternoon, pre-bagging all of the ingredients in the freezer for later meals), and most cook on low for 7+ hours, meaning those of us that leave the house for a full workday can turn the slow-cooker on in the morning and come home to dinner (not to mention wonderful aromas). 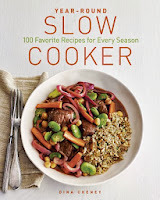 Year-Round Slow Cooker takes the slow cooker one step further, challenging readers to think of the slow cooker not just as the solution for fix-it-and-forget-it meals, but as a tool that can result in complex, flavorful dishes. Unfortunately, these complex flavors often come from pre-browning, roasting, toasting, and similar, and many of the recipes cook for under 7 hours, relegating them to weekend dinners for anyone with a 9-to-5. Combined, though, these two cookbooks present interesting new ideas and recipes for what is, for many, a well-loved but oft-discounted kitchen gadget (and would make great accompaniments for anyone gifting a slow cooker these days). Thank you to the publishers for providing e-galleys of both cookbooks for review. Yeah, I got the first one shown via Netgalley and found that many were just too complex for what I was looking for in slowcooker meals. I work from home now, but it's still nice to grab some good ingredients and let them cook all day. I just have so much more time after working to do what I want to do & that is always a plus. I'll have to check the 365 book out! The first one made some good recipes, but definitely weekend cooking for me since I'm in an office all day - I can't exactly be browning meat at 7 am and going home 3 hours later to change the temperature. The 365 book is not as sophisticated, but way more put-it-in-and-presto-dinner-is-done-8-hours-later! And so far, we've liked the recipes that have come out - they just aren't as complex (in prep or in flavor!) as the Year-Round recipes. 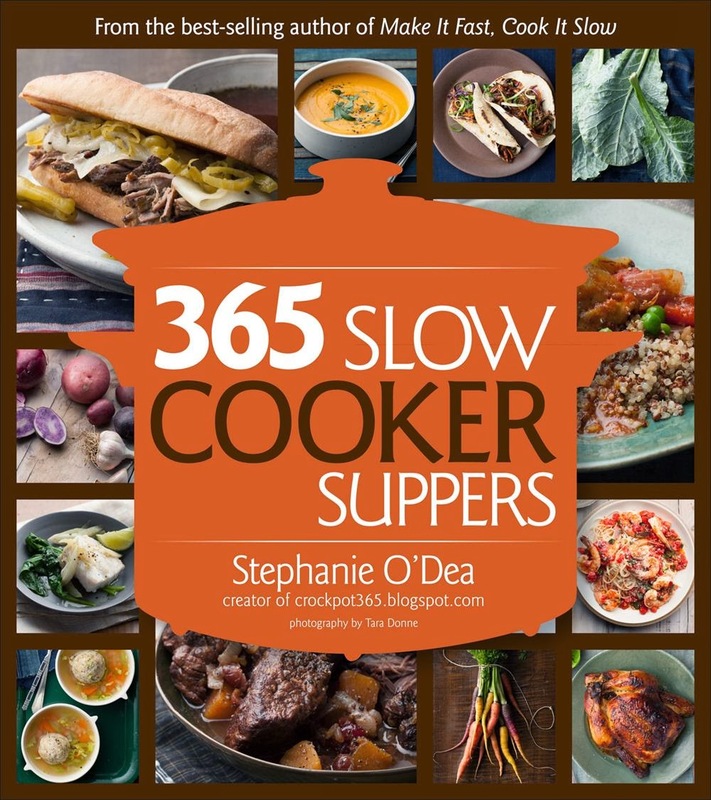 I may have to get 365 Slow Cooker Suppers. I use my slow cooker a lot and that one sounds more my speed. These both look interesting for different reasons. I do some combo cooking with mine already - cooking a whole pork roast in it and then cranking the oven up to high and putting it in at the end to crisp the skin - or browning meat or sauteeing a mirepoix before putting it in the crockpot. I'll have to keep my eye out for them and take a look a before I buy. I like Stephanie O'Dea! I think I have her first cookbook and I really like it. I love my crockpot :) I think I'm going to make chicken taco chili this week. Yummmm.